Setting for the film 'Picnic at Hanging Rock'. 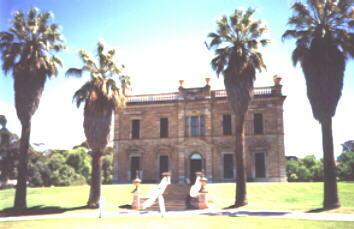 Martindale Hall is one of South Australia's best known historic houses and notable pastoral homesteads. Built on gently rising ground it commands a wide view across the countryside. The entrance hall, with black and white marble floor, leads into the main hall which gives access via a carved staircase to the first floor. This Georgian style mansion, about three kilometres from Mintaro, was designed by London architect, Ebenezer Gregg, and completed in 1879 for the princely sum of $72,000. The building project was supervised by Adelaide architect E. Woods. Almost all tradesmen who worked on Martindale came from England and returned when the job was finished. The ornately moulded and carved stonework is a tribute to the skill and care of those craftsmen. The nearby Coach House and Stables, like the mansion itself, are all constructed of local Manoora sandstone and quartzite and have six stalls, two coach stores, a forage room and a groom's room. Most of the mansion walls are about a metre thick and the ceilings are nearly five metres high to combat the heat of the Australian summers. All the furniture, and whatever else was needed in and around the house, was bought in England and arrived on the ship India at Port Adelaide on 6 April 1880. All of this was built for wealthy bachelor Edmund Bowman who had his own private training track and stable, a pack of foxhounds and on his own cricket ground entertained the English cricketers. The land originally belonged to Arthur Young of Scotland who sold it to Edmund Bowman of Werocate in 1855. The Bowmans settled in Tasmania in 1829 but one of their sons, Edmund, moved to South Australia in 1836. He drowned in the River Wakefield in 1866 but his son, also Edmund, inherited Martindale and many of his father's other properties, including Parara. 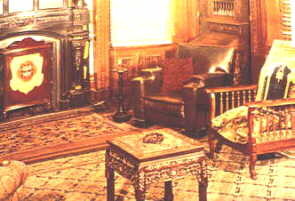 This is one of the most interesting rooms in the whole house and sometimes referred to as the Museum. The Bowmans of Martindale Hall accumulated several pastoral properties in the north of South Australia, lived in style and entertained lavishly. However by the late 1880s debt and drought forced them to sell all their holdings and in 1892 William Tennant Mortlock became the new owner of Martindale Hall. William Ranson Mortlock was twenty-two when he settled in Adelaide in 1844 to run the Globe Hotel. He eventually owned many stations, including Angorichina in the northern Flinders Ranges. When he died on 10 May 1884 he left his estate to his son, William Tennant Mortlock. Born on 18 May 1858 at Port Lincoln, William Tennant was educated in England and practised later Law in London before returning to South Australia in 1881. In 1891 he married his cousin Rosina F. Tennant and a year later bought Martindale Hall. They had six children but only two survived infancy. William Ranson died 16 July 1892, aged only eight months. Margaret Tennant died a year later on 21 June 1893 only three months. 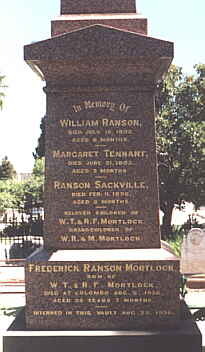 Ranson Sackville died on 11 February 1896 aged five months. Their son Frederick Ranson died at Colombo on 5 August 1836, aged thirty-five years, but was interred at the North Road Cemetery together with the other members of his family. William Tennant Mortlock died on 17 August 1913. His son John Andrew T. Mortlock, born on 30 March 1894 at Mintaro, eventually bequeated part of the estate to the University of Adelaide. Martindale Hall was transferred to the University by his widow in 1965.